Gamakatsu have added two new sizes to the EWG Monster worm hook range. 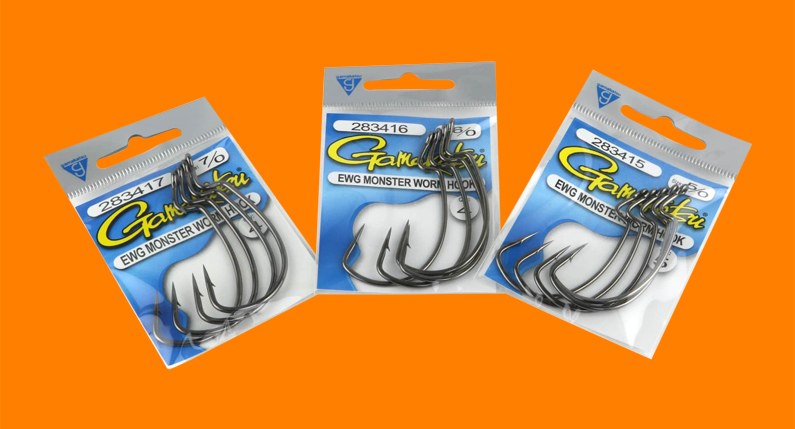 The new sizes offer more versatility, and build on the popular 7/0 EWG Monster. A 5/0 and 6/0 now complete the range of the strongest worm hook on the market. The EWG Monster was designed for only the largest plastics, and features extra heavy-duty wire, an inline hook point and an impressive black nickel finish. Coupled with Gamakatsu’s chemical sharpening procedure, the EWG Monster has impressive hook setting power, which is crucial when throwing big baits for large fish. The EWG Worm hook allows anglers to rig their lures in the traditional way with the hook point well exposed, or weedless. This offers incredible versatility, and the hooks can be used effectively in areas of heavy weed or timber, which are commonly encountered when chasing iconic species such as barramundi. EWG Monster worm hooks are also perfect in shallower water for offshore species such as snapper and kingfish with a slow sink offered by the unweighted hook.